"gadolinite." YourDictionary, n.d. Web. 22 April 2019. <https://www.yourdictionary.com/Gadolinite>. A dark green or greenish-black silicate mineral, Be2FeY2Si2O10, containing several of the rare-earth elements in combination with iron. (mineralogy) A dark, vitreous mineral that is a complex mixture of silicates of cerium, lanthanum, neodymium, yttrium, beryllium, and iron, with the chemical formula (Ce,La,Nd,Y)2FeBe2Si2O10. After the Finnish chemist Johan Gadolin (1760-1852), +‎ -ite. 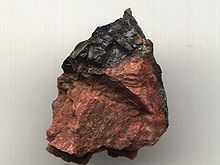 The first earth of this group to be isolated (although in an impure form) was yttria, obtained by Gadolin in 1194 from the mineral gadolinite, which was named after its discoverer and investigator. In 1878 Marignac, having subjected Mosander's erbia, obtained from gadolinite, to a careful examination, announced the presence of a new element, ytterbium; this discovery was confirmed by Nilson, who in the following year discovered another element, scandium, in Marignac's ytterbia. The first of the rare earth minerals was discovered in 1794 by Gadolin and was named gadolinite from its discoverer. In 1797 Ekeberg showed that gadolinite contained another rare earth, which was given the name yttria.